Newly renovated for 2018, the Granary is the third of three unique conversions of 17th century farm buildings in the grounds of an historic old vicarage in tranquil Little Tew, on the edge of the Cotswolds. The Granary offers luxury, private and comfortable accommodation for a couple to use as a base to laze or explore. The Granary is the conversion of a 17th Century Cotswold stone grain store, offering accommodation over the first and second floors. External stairs with views over the surrounding fields lead up to the Granary’s own front door. This leads straight into a fully equipped kitchen/dining room, featuring Belfast sink, dishwasher, induction hob, electric oven and all the equipment you could need to cook up and eat a feast; with views over the Granary’s dedicated garden, the dining table will comfortably seat four. Two steps, then passed the internal oak stairs through to the cosy sitting room with wood burner and plenty of logs. Flop into the sofa and doze the day away, watching the fire, the smart tv or listening to music via your device on the Bose speaker. 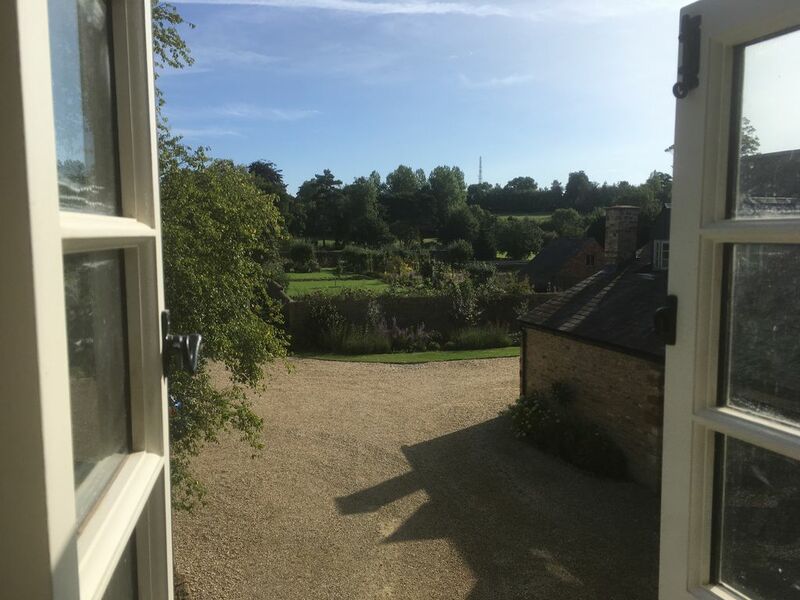 Alternatively pen your first novel at the desk/daydream whilst enjoying views over the walled garden. If all this proves too much, head up the stairs to the King size, white linen bedroom nestled in the eaves. Once again totally private yet with views over the walled garden and surrounding countryside rural remedy is assured. A landing with wardrobe two more steps to a laundry cupboard, with washer/dryer leads you to the luxurious bathroom with freestanding cast iron bath and loo with a view to complete the accommodation. We stayed in the Summerhouse, rather than the Granary (because there was a long-term visitor in the Granary). We loved the Summerhouse - it was very spacious, stylishly decorated and had it's own private garden. The location was perfect for our stay, as we were attending a party in a nearby village. We really appreciated the 'welcome pack' which included everything we could want as well as some lovely fresh produce from the garden. It was very peaceful and is surrounded by pretty countryside and villages - perfect for cycle rides (which we did) and country walks. We would definitely come back here if we were visiting the area again.